The Occupy Wall Streeters turned their ire toward the “evil vampire squid” Goldman Sachs today. The Occupy Wall Streeters, joined by Princeton professor Dr. Cornel West and columnist Chris Hedges, convened at their Zuccotti Park headquarters for a 99-minute hearing against the investment bank. After the hearing concluded, the group issued a “guilty verdict” against Goldman for fraud among other things and proceeded to march to the 200 West Street offices. 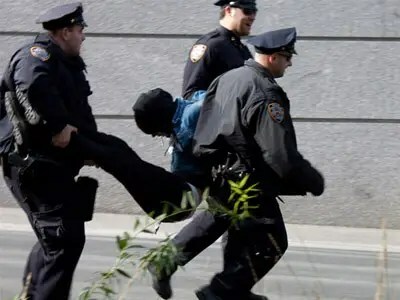 At least 15 people were arrested outside of the Goldman Sachs building during the demonstration.